The design of Bitcoin and the blockchain, its public transaction ledger, make it challenging to distinguish specific types of transactions. Nonetheless, researchers from the U.S. Federal Reserve determined in a recent analysis that the currency is “still barely used for payments for goods and services.” Last week, nearly 200,000 bitcoins changed hands each day, on average. But fewer than 5,000 bitcoins per day (worth roughly $1.2 million) are being used for retail transactions, according to estimates by Tim Swanson, head of business development at Melotic, a Hong Kong-based cryptocurrency technology company. After some growth in 2013, retail volume in 2014 was mostly flat, says Swanson. “Some of the New York Bitcoin Center guys are pretty religious,” says Tim Swanson, who has written two e-books on cryptocurrencies in the past year, most recently The Anatomy of a Money-like Informational Commodity: A Study of Bitcoin. Before that, while living in China, he built his own graphics-chip miners. (Some of his miners have since been re-purposed as gaming systems.) Swanson has grown increasingly skeptical that Bitcoin will unsettle the existing finance megaliths. “You have centralization without the benefits of centralization,” he says. Bitcoin’s promise of frictionless finance is drowning in the ever more immense cost of mining, user-friendly infrastructure, and appeasing regulators. Beyond Bitcoin, episode #27: An Architecture For The Internet Of Money at Let’s Talk Bitcoin. In this episode, Meher Roy does a fantastic job explaining what a neutral, agnostic protocol actually is and why the current allotment of cryptocurrency “protocols” are not real protocols. Many thanks to Arthur Falls for his time, patience and great questions. We will all miss the show. Can Bitcoin’s internal economy securely grow relative to its outputs? Because as described in a number of other posts, “Bitcoinland” — a “virtual-state” — probably has more in common with the economic dynamics of a “nation-state” than say, agnostic, inflationary computer protocols like TCP/IP/HTTP. So what is the “killer app” for a meat space economy like China? How, as measured in GDP, did China grow from 364 billion RMB ($58 billion USD) in 1978 to 58 trillion RMB ($9.4 trillion USD) in 2013? Was it solely the result of Deng Xiaopeng efforts of “reform and opening up?” The full answer to that involves surveying numerous books; the shorter answer involved a combination of liberalizing a nearly fully autarkic economy and improving the productivity levels of existing inputs. In the physical world, one way to measure how an economy develops is by looking at something called total factor productivity (TFP). An increase in TFP is largely a result of technological improvements, inventions and innovations. That is to say, for the same quantity of inputs, more outputs are created. We see this frequently occur in developing economies as subsistence farmers adopt mechanization to improve agricultural yields, sometimes by several orders of magnitude. For instance, the 2011 harvest yields in Heilongjiang province China, broke nation-wide records, rising 11% over the previous year due to ‘bigger and better machinery for threshing and plowing’ (for more specifics see also: Wage Growth, Landholding, and Mechanization in Chinese Agriculture). Historically, as an economy develops, the inputs (such as land and labor) become more productive and therefore produce more outputs. Can the internal Bitcoin economy also see such productivity gains? Maybe, but probably not securely. Let’s rewind for a moment. Because there is no land per se, let us instead look at the labor component of Bitcoinland. Unlike the labor market in the real world, this virtual-state has a marginal productivity of labor of zero. It is very unique in that manner. That means irrespective of the amount of hashing power (or laborers) added or removed from the network, the virtual country will always (and only) produce a fixed amount of output (block rewards). Both David Evans and Tadge Dryja independently discussed this observation last year. 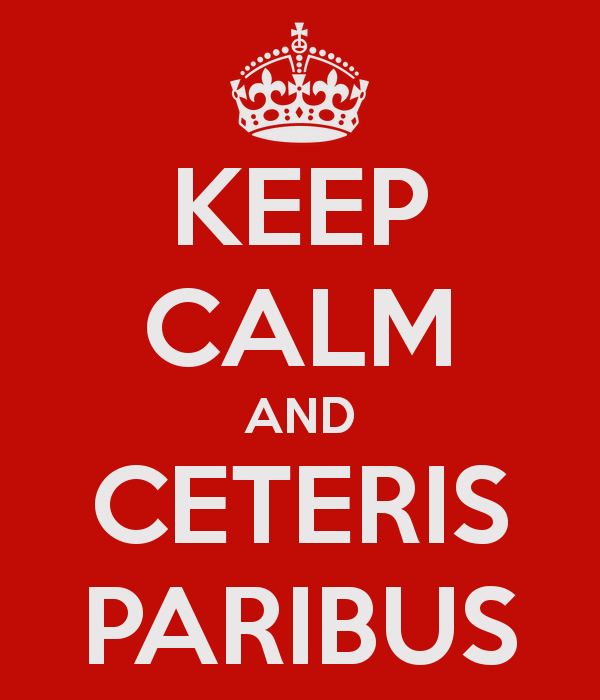 Simultaneously, this virtual country’s economic output is secured through proportionalism: ceteris paribus, in the long-run it should take a bitcoin to make a bitcoin. Rational laborers (miners) will not spend more than a bitcoin to make one. Thus if a coin is worth $250, miners as an aggregate will not spend more than $37,500 per hour to secure the ledger. Recall that maintaining a distributed consensus network is different from consensus on a centralized ledger. Bitcoin was purposefully designed so that it is artificially expensive for people to cast “votes” for a consensus. The necessity was to make casting “votes” in the consensus artificially high since we cannot know who is participating in the “vote” (because it operates on an untrusted network). What is another way to look at this? The security model of Bitcoin is how much it would cost a malicious attacker to gain a significant portion of the network. The security model of Bitcoin is therefore an anti-Sybil attack mechanism and not necessarily focused on securing financial transactions. This begs the question: Is any financial transaction secure if the cost of reversing it is less than the value of the transaction. Or would we need a system in which it would cost $1 million to undo $1 million of value? This question is difficult to answer in the abstract. For different use cases, there might need less proof-of-work needed in order to secure the transaction. There could be a few reasons for this. In many cases the issuer of the goods may be able to monitor the network for an attack waiting for sufficient work to be done before issuing the goods, e.g. Warehousing and physical delivery. For account balances, the victim could alter the balance of the attacker. There are very few $1 million transactions that are consumed instantly. However it does throw high value escrow services based in Bitcoin into question. In the original white paper, Satoshi, albeit incorrectly calculated the probability of successful block reversals by an adversary. From this a magic number of 6 confirmations was often deemed as secure. I think this security model should be framed as burying a transaction under some dollar equivalent value of proof-of-work. This might give businesses more accurate view of the security of bitcoin transactions. One unfortunate reality for assessing the security of bitcoin transactions is that we still need to factor in market concentration due to the possibility of bribes and corruption. Where some of these pools would actually find it profitable to attempt block reversals, a la selfish mining, it is difficult to think of an economic model for bribery and corruption in the Bitcoin network. Furthermore, we have seen the discussion take place on gated entry where you can make the entry into the validating nodes set super secure but someone may be able to bribe that entity to reverse / block transactions. What does Levin mean by the cost of reversing a transaction? To successfully disrupt the country (the network), the maximum cost to do so is roughly 0.5 x MC, where MC is the marginal cost of production. In today’s terms to brute force the network — to attack it head on through its hypothetical ‘Maginot Line‘ it would in theory cost half of $37,500 per hour (or rather, half of the aggregate of 6 blocks as Levin suggested above) to obtain the magical “51%” of the hashrate needed to continuously double-spend. In reality, the actual cost is significantly less due to out-of-band / side-channel / rubber hose attacks. But that is a topic for another article. A parasitic unit of account? There is a different reason for why we maybe should be concerned about the appreciation of the exchange rate because whenever you have an economy where the expected return on the medium of exchange is greater than the expected return of the underlying economy you get this scenario, kind of like what you have in Bitcoin. Where there is underinvestment in the actual trade in goods and services. For example, I don’t know exactly how much of bitcoin is being held as “savings” in cold storage wallets but the number is probably around $5 billion or more, many multiples greater than the amount of venture capital investment that has gone into the Bitcoin space. Wouldn’t it be a lot better if we had an economy, where instead of people hoarding the bitcoin, were buying bitshares and bitbonds. The savings were actually in investments that went into the economy to fund startups, to pay programmers, to build really cool stuff, instead of just sitting on coin. As I noted in a previous article, the $500 million that VC’s have deployed to build Bitcoinland are effectively a foreign exchange currency play (because it is a virtual-only foreign country that can only be accessed with a pre-paid card, bitcoin). This money is being paid to effectively leverage one economy, or rather one unit-of-account (namely USD, EUR, RMB) to build a virtual unit-of-account called BTC. I think the issue if should you have more elastic supply or not it just really comes down to the fact that if you have a fixed supply of something, the only way that changes in demand can be expressed is through the change in price. And people have expectations of increased demand so that means those expectations, expectations of future demand get translated into present day prices. And the inelastic supply creates volatility in the exchange rate which kind of undermines the long term objective of something like cryptocurrency ever becoming a unit of account. And forever it will be a medium of exchange that’s parasitic on the unit of account function of national currencies. So I do think the issue does need to be addressed. What does this have to do with “growing” the GDP of Bitcoinland? And more to the point, how can Bitcoinland increase the amount of outputs? If the labor force in Bitcoinland, miners, are continuously expanding and contracting the amount of capital they destroy to secure the network (in concert with the market price of the token), then the size of the Bitcoin economy is continuously shifting in size each hour, day, week and month. Or in other words, as measured in terms of several foreign unit-of-accounts (because the physical land, electricity and hardware are paid for in foreign currency): the size of Bitcoinland is directly proportional to the amount of fixed outputs. Denominated in BTC, the economy grows at an incrementally fixed rate. It cannot, due to deterministic rules, be more productive in terms of outputs. It can only grow larger and/or faster than this fixed amount through what amounts to ‘secondary issuance’ of watermarked metacoins such as Counterparty, Mastercoin and colored coins. As described below, while this is not an issue today, these hacked-in under-secured metacoins are a double-edged sword. Why? Because these metacoins create a disproportional rewards vulnerability discussed last year. Recall that metaprotocols (or sometimes referred to as ’embedded consensus mechanisms’) that utilize and sit on top of Bitcoin blockchain provide disproportional rewards. For instance, while both Counterparty and Mastercoin require participants to pay some nominal transaction fee, the social value of the actual asset itself if effectively piggy backing and free-riding off seigniorage rewards (this also happens with colored coins and Dogeparty). Aside from mining pools that use Luke-Jr.’s software, miners in general currently have no way to distinguish between a watermarked transaction from any other transaction. Consequently, they have no incentive to destroy more capital to protect these metacoins in part because they receive no additional revenue to do so… because the network and coinbase itself has no knowledge of the social value placed on these metacoins and therefore cannot distribute rewards in proportion to the actual value being protected. And the network then is effectively top-heavy. For example, if for some reason Apple Inc. decided to issue all of its shares onto the Bitcoin network via a metacoin, this could create a top-heavy security vulnerability. Recall that the total market cap of Apple’s shares is ~$750 billion USD but the labor force of Bitcoinland is only destroying enough capital to secure ~$3.46 billion in bitcoins (at the time of this writing $250 x 13.85 million mined coins). Thus in the long run, miners are probably not destroying enough capital to ultimately secure metacoin assets, making the network less secure. Or in other words, Bitcoinland — as it is encoded today — probably cannot securely increase its productivity levels (as would be measured by TFP) without opening itself up to some kind of vulnerability. Last year I wrote a short working paper discussing the potential of merged mining as a way of productively reusing the existing capital base. In theory it sounds like an easy home run but in practice, if it costs miners nothing to merge mine, then it also costs them nothing to attack the merged chain/coin. Relying on and trusting in goodwill or altruism of a labor force is the direct antithesis of the game theory baked into Bitcoin itself: where it is assumed that all parties can and will be adversaries. Empirically we have seen Bitcoin pools attack chains that have attempted to merge mine (see Coiled Coin). We have also seen (above) how Namecoin’s hashrate has diverged over this past year and how it now consistently represents less than half of Bitcoin’s (note: Namecoin began merged mining with Bitcoin in October 2011). Or in other words, if it depends on the growth of an underlying unit-of-account hoping for an unseen Bitcoin GDP multiplier (or in this case a non-currency ‘killer app’) probably is similar to wanting something for nothing. 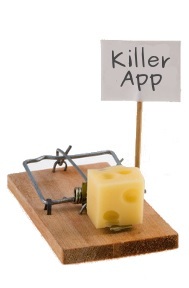 That doesn’t mean it shouldn’t be tried or that all the startups in this space are for naught. In fact, it looks like there are any number of useful innovations with practical applications (such as hierarchical deterministic, multisig, keyless wallets, etc. ), including the experiments coming out of the altchain/ledger community. Several investors and entrepreneurs willing to navigate the space could see a good return if some of these innovations become integrated within other industries (such as financial services). Yet in practice, operating a distributed consensus network based on proof-of-work seems to require an always changing capital allocation structure that is fused to the market value of its internal unit-of-account relative to national currencies. And based on the current version of the program, Bitcoinland itself (and not the ecosystem on the edges) may likely remain a laboratory model of a marginally subsistence nation that (often) violently moves between contractionary and expansionary cycles. Aside from currency conversion, can there be a stable, secure domestic economy within Bitcoin. If so, what is or could be another identifiable, exportable good or service? As its labor force (miners) must continuously exchange the domestic currency (BTC) into a foreign currency (USD, EUR, RMB) to pay for bills — what is the recent historical precedence of economies that start off subsisting off of a foreign unit-of-account that later manage to move on to become an independent unit-of-account for economic calculation purposes? Can other Bitcoin-like cryptocurrency economies actually grow, or are they all faced with similar constraints with respect to proportionalism? Existing metacoins require their own consensus systems and as such, they don’t fully rely on Bitcoin. Can this be further enhanced? Is the adoption of blockchains and consensus ledgers a foregone conclusion? Earlier this evening I gave a new presentation to the Sim Kee Boon Institute (SKBI) for Financial Economics at Singapore Management University (where I am a new research fellow). Covered a lot of ground over 2 hours, I am not sure if there is a recording but will post it if one surfaces. Below is the deck that I used. Many thanks to David Lee, Ernie Teo, William Mougayar, Mikkel Larsen, Taulant Ramabaja, Taariq Lewis, Dan O’Prey, Bobby Ong, Meher Roy, Richard Brown, Sidney Zhang, Dave Hudson, Jonathan Levin and Robert Sams for their feedback. For the past two years, many entrepreneurs, developers, investors and enthusiasts have promoted the view that blockchains and in particular, Bitcoin will eventually be adopted as a universal value transfer mechanism — a type of global payment rail fit for a cornucopia of use-cases. Empirically this does not seem to be the case as over the past year and specifically the past 6 months, multiple startups have been created that specialize in areas that Bitcoin is not particularly well suited for. Whether any of these succeed is another matter entirely, but it is not a foregone conclusion that any one blockchain will be the “one to rule them all” based on their competitive (dis)advantages. This presentation outlines a number of vendors that have either announced or are working on solutions for the broader “Fintech” space as well as incumbent institutions in the existing ecosystem. I haven’t seen a video, so it’s unclear if this is a summation of their thoughts. But in terms of the infrastructure costs of Bitcoin, this is probably not comparing apples to apples because the incentives and costs to successfully attack the Skype network are very different than a network such as Bitcoin. If the cost to maintain Bitcoin’s infrastructure is zero, so too is the cost to successfully attack and fork it. In fact, just about anyone motivated to do so could have successfully “attacked” (e.g., double spent or do a block reorg) the Bitcoin network in its first 18 months because the hashrate was relatively low because the value of the token was negligible (e.g., miners weren’t consuming additional units of capital because there was no financial incentive to do so). For example, by the end of June 2010, the network strength (detailed here) was around 139 megahashes/second. To obtain half that hashrate, or 70 megahashes/second, an attacker would need to only spin up about 10 Xeon processors which could be obtained through AWS relatively cheaply (note: Satoshi probably used just one computer). It was not until market participants increasingly valued the coin (vis-à-vis higher demand) which then in turn incentivized miners to destroy a corresponding amount of capital to protect the ledger. Or as one developer recently explained: the maximum cost to successfully attack Bitcoin’s network is directly proportional to the market value of the token. It is intentionally designed to be expensive to attack otherwise anyone could change the history. Or as Richard Brown has explained, proof of work as used in Bitcoin is “inefficient” on purpose. In practice miners are taking one currency (USD, EUR, RMB), usually one denominated based on where the equipment is located, and through the process of destroying exergy (see Chapter 3), converting it into a foreign currency called bitcoin. Or in other words, miners are currency convertors. And irrespective of scale, “to mine” is effectively taking a long position on bitcoin versus a fiat currency (recall that the mining equipment and operating costs are paid for in foreign currency). For many actors, it is not just a forex bet but also a gamble on appreciation. As discussed in Chapter 3, there are at least two classes of actors willing and able to mine at losses, including some who hope that the token will appreciate in value. I, along with several others, have written about this numerous times. In the long run, most miners, if not all, do not actually generate economic profit because of how the difficulty rating adjusts proportional to the amount of hashrate that is added to the network (e.g., the “Red Queen effect”). If it becomes cheaper to “mine” then the situation will simply incentivize more hashrate to be added resulting in a higher difficulty rating, negating the temporary advantage. In the short run, there are actual differences in margins due to differences in climate, electricity prices, administrative overhead, taxes, etc. Some, such as BitFury and a few in China, have better economies of scale and/or handsome land and energy deals due to guanxi (a few consequently have “cost of production” down to $80 per bitcoin and even lower as of this writing). Unless you have mined some kind of coin before (see 12 Step Guide), in order to understand how mining actually works we must begin by noting that most miners are not actual miners, but rather hashers who effectively ‘rent’ their equipment to pools (pools charge a fee in exchange for this service). Miners, technically speaking, are the machines that actually select, process and validate a transaction. Hashing equipment does not do this. 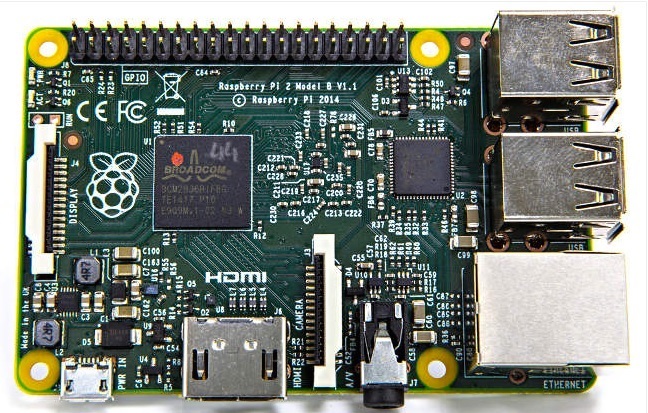 For instance, CoinTelegraph recently ran a story on the new Raspberry Pi 2 Model B which costs $35. This Pi computer (above) is effectively the only miner, the only “transaction processing” machine in an entire mining warehouse. Since the entire Bitcoin blockchain can and is processed with something this cheap, why is mining so expensive then? That is where Sybil protection and decentralization come into play. 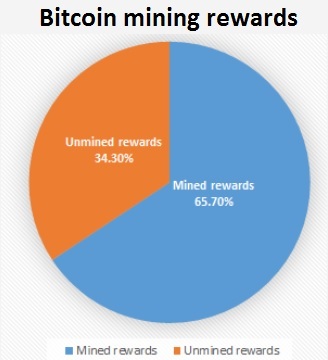 Recall that for the supply side of the equation, miners compete with one another to win the block reward (since it accounts for roughly 99.5% of their revenue, a figure which hasn’t changed much in a couple years, see below for more). Thus, rationally economic actors will strip a mining facility of anything that lacks utility (in some cases, even computer “cases” themselves). If it is not hashing, it is not helping to generate income. Thus in all warehouses today, they have row after row of specialized machines called ASICs to provide this spartan hashing function (recall this was all initially spurred on by ArtForz creativity). In practice, this hashing equipment actually just asks for a block header from the host node of a pool (such as the Pi Raspberry) and only “hashes” the “midstate” but that is another discussion entirely (see this excellent explanation from Vitalik Buterin). Thus, the only bona fide “mining” equipment in a facility is usually something akin to the Pi computer above. So what utility do those rows of ASICs provide then? As shown in the video (above), the sole job of those single-use ASIC machines are to provide “proof of work” hashing power which thereupon provides Sybil protection for the blockchain. The video above was filmed in Liaoning province in China last fall by Vice magazine. Be sure to also read more details from Jake Smith’s article covering the same facility (he was also the laowai translating in the video). 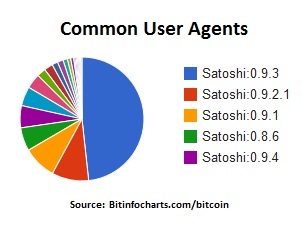 Or in short, in an alternate universe in which Satoshi had created a different distributed yet secure consensus protocol (one that may or may not exist) in which the infrastructure costs did not directly scale in proportion to the value of the token, $780 million could have been instead used to hire 7,800 full-time developers (based on SF Bay wages). But the Bitcoin network doesn’t need those developers, the current network can do everything the incumbents provide right? Based on at least one post, Satoshi may have hoped to compete with Visa but he/she could turn out to be empirically wrong, there are real costs to maintaining a decentralized network. As it stands today, the Bitcoin protocol does not offer any of the actual banking and credit services of existing financial institutions. Consequently, recall that the expenditure and threat models on ‘trusted’ centralized networks are different than ‘untrusted’ decentralized networks. As I and others have described elsewhere, Sybil protection and decentralization add costs to operating a network — they do not in fact, make it cheaper. There is no free lunch or “free energy” in the mining process, anyone claiming that proof-of-work-based “mining” will somehow become ‘cheaper’ in the future is in the same class as the perpetual motion salesman. Another way to think about it: the $500 million that VC’s have deployed to build Bitcoinland are effectively a foreign exchange currency play (because it is a virtual-only foreign country that can only be accessed with a pre-paid card, bitcoin). This money is being paid to effectively leverage one economy, or rather one unit-of-account (namely USD, EUR, RMB) to build a virtual unit-of-account called BTC (see more from Robert Sams). But, and this is important for international adoption: there are no real corresponding exports from that economy (yet). Furthermore, there are several reasons why the narrative of social media enthusiasts will likely not go according to plan. Investor and entrepreneur interest may still be in the “early days,” but the asymptotical reward structure rapidly aged this economy into its twilight years much like early stars. As of this writing, approximately 13.8 million bitcoins have been divvied out to miners over the past 6 years. This represents roughly 2/3 of the internal income the Bitcoin trust fund had at the beginning. More than half of the remaining will be apportioned in the next five and half years. One common refrain is that at some unknown date and time, transaction fees will somehow increase and/or more users will collectively pay more fees. This is a possibility but is unlikely for the reasons discussed on numerous occasions for reasons described in this working paper (it is a type of collective action problem). In fact, the biggest counterpoint to this is that we have direct evidence to the contrary. The chart (above) illustrates the total transaction fees to miners (denominated in USD) over the past 2 years. Denominated in BTC, the 2 year chart shows the same trend line. Fees to miners is actually at a 2 year low (in BTC) and not increasing despite the fact that there are now more than 100,000 merchants that accept bitcoin for payments (up from 20,000 last year). Why is merchant adoption far outpacing consumer adoption? Well there are multiple reasons which I and others have discussed before. More on that later. Perhaps there is another way to visualize this historically, from the beginning? The chart (above) is from Organ of Corti and illustrates what I mentioned at the start of this post: that roughly 0.5% of a miner’s revenue comes from transactions (effectively, user donations), the vast majority still comes from the block reward. But isn’t the retail economy booming and will balance this out? No. As shown from Jorge Stolfi (and Coinbase’s own chart), on-chain retail growth is stagnant (in fact, it is one of the glaring omissions in Bitpay’s new infographic). Why? Because most consumers are, in practice, not incentivized or otherwise interested in converting their local currency into a foreign currency for goods or services they can already buy with their existing currency. Endless threads on social media have proposed solutions to this inertia, but the fact of the matter is in practice, consumers are only willing to change if and when the alternative is not just as useful, but significantly so (there is an entire segment of economics that studies consumer choice and indifference curves). And they are only going to use something if it provides them more utility. Thus to them, entering Bitcoinland (and current cryptocurrencies in general) is a friction they have preferred to avoid. Perhaps that will change, but then again, maybe not. Again, recall that the primary utility provided by the Bitcoin blockchain was to circumvent trusted third parties (TTP), which in practice, the average consumer are okay with having to deal with (the tradeoff between less privacy for more insurance, etc.). For instance, in terms of demographics, the vast majority of gamblers that use bitcoin are based in the US because online gambling is illegal here. European gamblers typically use bank transfers. When SatoshiDice blocked US-based IPs, gambling volume dropped significantly for them (and flowed to other similar sites). Maybe there will be another “killer app” but then again, maybe blockchains in general attract illicit activities because their decentralized nature enables routing around TTP, which some bitcoin holders find useful and attractive. One last issue that intersects with miners and the Bitcoinland consumer economy is that of volatility. This is a topic that generates enormous reaction and I am aware of companies such as Bitwage, Hedgy, Teraexchange that are attempting to create either hedging mechanisms against volatility and/or bridges between two different unit-of-accounts. What this has looked like in practice is that miners themselves are creating a currency with which they are not necessarily able to pay their electricity bills or leases with. They have to convert it. Perhaps this will change, but since the bulk of this virtual currency has to be converted into a foreign currency (USD, EUR, RMB), it creates continuous sell-side pressure on the market (see How do Bitcoin payment processors work?). And without a corresponding increase in demand from those holding foreign currency, the market price declines. Hedging may help mitigate some losses for a few of the merchants that choose to keep and not convert bitcoin payments they receive, but again, hedging isn’t free. It also costs someone something to do — hedging can be expensive, this is why corporates do not typically hedge against ongoing foreign revenue but they only hedge against large one-off items (such as acquisitions, or large shipments / purchases). Just ask the airline industry about its fuel hedging strategies. Recall again that consumers in general prefer stable purchasing power for medium’s-of-exchange (no one is trying to directly use petroleum as a currency). Without a circular flow of income, this is unlikely to change and this is something that requires years, perhaps even decades to build even with dynamically adjusted, elastic money supplies. For instance, recall even with its $9.5 trillion economy and its $2 trillion in exports, the RMB only represents 2.17% of all international trade settlements (for comparison, the Greeks exported €27 billion in goods and services in 2013). Perhaps indeed, Bitcoinland is still in the “early days” — or maybe its fixed monetary supply has inflicted it with incurable progeria (i.e., few want to spend it, so not enough fees to replace the block reward). And thus its main exports will continue to be ways to distribute exergy via currency conversion processes and illicit trade. 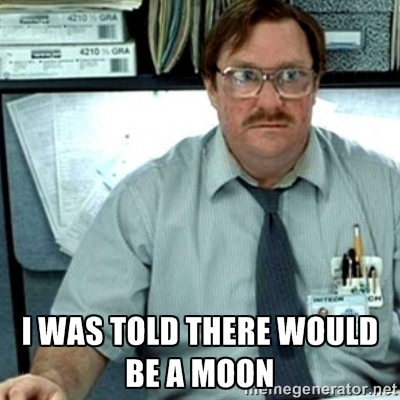 Earlier this week William Mougayar encouraged advocates in this nascent space to basically chill out with the moon rhetoric. Again, it is impossible to know what consumers will eventually adopt. Anyone claiming that there will just be “one winner” that encompasses all use-cases is probably wrong in the short run (note that Richard Brown and Meher Roy have suggested that there may be some kind of “Grand Unified Theory” of cryptofinance but that is a topic for another post). Every business, institution and customer has different wants and needs that will dictate actual adoption of technology and not the other way around. Entrepreneurs, developers and investors cannot assume a market will adopt their own narrative any more than shipwreck survivors can “assume a boat” — thus as Mougayar has touched on: blockchains and consensus ledgers may find traction outside of niches only if they satiate mass consumer appeal, not just hobbyist interest. To the chagrin of the heavily invested, Bitcoin may prove to be the vehicle that will spawn a variety of useful mainstream tech but that will never actually go mainstream itself. In that respect, perhaps Bitcoinland is essentially a huge R&D program. Perhaps this is a modern facsimile of The Rise of ‘Worse Is Better.’ Bitcoin enthusiasts believe that they are the “New Jersey” crowd in this particular story but in truth they may be taking the “MIT” approach, where they are seeking to build a perfect new financial platform. The lesson of the story is that the MIT approach almost always fails because it is incredibly hard to do and relies on perfect up-front understanding, while the New Jersey approach favors incremental discovery and evolving things towards something that works well enough. Or maybe, conversely, some black swan event such as a large hedge fund publicly announces major buys or an ETF is approved or large-scale regulatory clarity occurs (see also: the Bitcoin Bingo card); we can only know in retrospect. In the meantime, other mental models are being discussed including a separation of specialized distributed ledger systems (via consensus-as-a-service) from the current crop of cryptocurrency systems as well as proposed a dual-currency solution (such as Seigniorage Shares) that could end up implemented in other projects such as Augur’s prediction market: it could also be used for CFDs, it does no one any good if the underlying currency is too volatile to price contracts in — even if you “win” you could still lose due to currency depreciation (this is not an endorsement). Other ideas such as the new replace-by-fee patch targeted at providing a mechanism for miners to prioritize transactions or metacoin censoring tools to allow mining pools to filter out watermarked coins (colored coins, Counterparty, etc. ), will undoubtedly provide empirical feedback to future ledger designers on what to do and not to do. Welcome to Bitcoinland, a virtual world whose artificial age is more akin to Sumter County than Madison County and whose primary export is currency conversion via exergetic displacement. On-chain population: roughly 380,000. What about the new BitLicense revision? It is still unclear to me whether the BitLicense is establishing a facilitator regime (like money transmission or custody) or an intermediary regime (like deposit taking). Does the BitLicense permit the acceptance of deposits by licensees? If not, then the question remains whether organizations like NYDFS and DOJ considers hosted wallet services to constitute deposit taking. If so, BitLicensees would presumably not be able to avail themselves to the securities exemption that is available to banks and other deposit takers. A deposit is a debt owed by the depository to the customer (depositor). 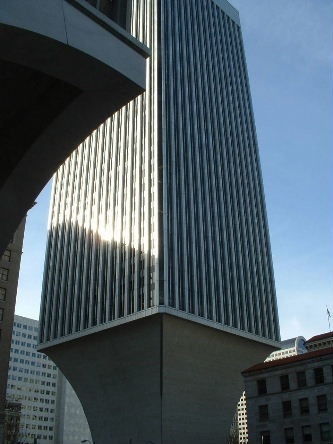 Does holding oneself out as a depository qualify as a securities offering? If so, would licensees qualify for the bank exemption to the securities laws? Obviously I’ll let the lawyers hash this out, but so far the interpretations of what “software” is or is not still seems vague especially since it is still not clear if these firms will be classified as a “custodial regime” as custody denotes possession and bitcoins arguably cannot be possessed in any sense (e.g., is Blockstream acting as a custodian for building and providing a service that enables federated pegs; are the servers that participate as the federated nodes liable?). Over the past couple of months there has been a number of discussions revolving around increasing the Bitcoin block size from its current 1 MB limit to 20 MB. One such plan is Gavin Andresen’s proposal (this is not to single him out as there are others with similar proposals). The code change itself is trivial, as it can simply be changed to any arbitrary number in a couple of keystrokes (for instance, see Vitalik Buterin discuss this at 14:15). However, getting the majority of validating nodes, miners and the rest of the ecosystem on-board in a timely fashion is a very non-trivial matter. Recall that, as illustrated by Organ of Corti and Dave Hudson, the average block size has increased over the past year to the point where we will likely max out at around 3 transactions per second with the current 1 MB limit. Since many of the investors, developers and entrepreneurs in this space would like to make Bitcoin ‘competitive’ to other payment platforms such as Visa, according to their view, this number eventually needs to increase by several orders of magnitude. Retaining a 1 MB block size ultimately results in higher transaction fees because block space is scarce and miners will only process and include transactions based on market-based prioritization rates (e.g., pay higher to be included faster). While this would likely mean the end of certain types of transactions (such as “long chain” transactions) as well as fee-less transactions which have disproportionally increased the size of the blockchain over the past six months relative to actual commerce, simultaneously this design decision would have the effect of retaining some nominal decentralization as the increase in blockchain size would remain relatively linear and thus the blockchain could be validated by several thousand nodes as it is done today without (much) additional cost. In early March 2014, there were approximately 10,000 nodes however over the past year there has been a decline by roughly 1/3. What does this distribution of roughly 6,400 current nodes look like? Recall that the original value proposition of the Bitcoin blockchain was its decentralized characteristic, thus the more miners and validation nodes that are geographically distributed, the less prone the network is to single-points of failure. Furthermore, while many people call the various artifacts that have increased the blockchain size “bloat,” because this is a public good and no one owns it, it is imprecise to do so (e.g., one man’s 80 byte “trash” OP_RETURN is another man’s data storing “treasure“). Whether consumers are sensitive to this change in fees is another matter due to elastic demand, they may simply switch over substitute goods (e.g., competing chains and ledgers). What does this mean exactly? An increase to a 20 MB block size would likely continue the same “low” fee (donation) structure practiced and promoted today as there is purportedly more room for non-priority transactions. The known challenge however is that if 20 MB blocks became “filled,” this would require a corresponding increase in bandwidth and disk space which would require more costs to be borne by the validating nodes which are already operating as public goods. That is to say, a blockchain that increased in size by 20 MB every 10 minutes would fill over 1 terabyte a year which would create additional costs for participants and likely reduce the amount of verification nodes and therefore reduce the decentralization of the network. The other challenge to Andresen’s plan is, that because the prioritization of transactions would still not be adjusting towards via fees to miners, this would in turn continue the status quo in which miners continue to largely rely on seigniorage to operate. This is an unhealthy trend as it stalls the transition from block rewards to fees which was the narrative stated since day one on October 31, 2008 (see section 6). It is difficult to predict what exactly will happen as the key actors in this space are still deciding what to use social capital on. Gavin Andresen, as recently as two weeks ago, stated that most of the large payment processors, exchanges and other service companies are on-board with his plan (see also David Davout’s recent dialogue with Andresen). Furthermore, others in the community have (likely erroneously) found correlation between market cap and transaction volume yet as we know, correlation does not actually imply causation. Similarly, ‘Death and Taxes’ recently presented a narrative reinforcing Andresen’s view yet for some reason glossed over the all-important miners perspective. Others, such as in the ideological wing personified by Mircea Popescu claim that they will fight this effort with an actual attack. Irrespective as to what size a block is increased to, it will likely create at least a temporary fork as validating nodes need to upgrade and they are not being compensated for storage and traffic (Andresen’s plan is to “future proof” the protocol such that the 20 MB change is included in a patch this year but isn’t “turned on” until needed later on). There is at least one open question: what is the minimal amount of full nodes that are required for network to operate within current trust/security model? Unlike miners, their value to the system is hard to measure. I think that the 20mb proposal is untenable given the current way that blocks are propagated around the Bitcoin network. The Bitcoin network and specifically the Bitcoin miners use a gossip network to relay blocks to each other. That means that as the size of the block increases, the time that it takes to spread around the network also increases linearly. We have seen this first in the work of Decker and Wattenhofer as well as my own work. The problem is that the increased time that blocks take to propagate around the network increase the probability of orphan races between different mining pools. If you create blocks that are 20mb and a competing pool is creating blocks under 1mb or even empty ones, they have a higher expected return per hash. This is because you would expect your blocks to lose out to smaller blocks in an orphan race if both are found in quick succession. Now we can argue that miners will continue to create large blocks out of altruism but if we continue to increase the size of the blocks without greater utilisation of better block relaying protocols we risk breaking this equilibrium and miners resorting to nasty strategies like creating empty blocks which suit no one. I also spoke with several other professionals in this space. On the one hand, increasing block sizes, as you say, may result in lower transaction fee requirements. However, if the transaction fees actually are lowered by, say, 1000x what they are now (0.00001 is the minimum accepted by the reference client), this will lower the cost of “institutional attacks” on the Bitcoin infrastructure, where an attacker can push 1000 transactions for an erstwhile cost of 1. The attack will basically be “make infrastructure expensive to run for the average joe, drive them towards centralized infrastructure services that run APIs, Blockchain Explorers, etc.” It is good for business, bad for the decentralization of the network in the near term. We’ve seen something like this occur on the Dogecoin Network in the past few months, where one user or a group of individuals were pushing transactions with 0 transaction fees. These transactions were accepted as valid by the Dogecoin reference clients, and as a result, caused bandwidth consumption hikes for the dorm-room nodes, which populate most of the current network(s). The resulting change by the Dogecoin Core team was to add a fee of 1.0 DOGE for every transaction, which isn’t yet mandatory, but is on its way there. The dorm-room nodes, however, are already on the decline in both Bitcoin and Dogecoin due to the increasing size of the Blockchain, and the bandwidth consumed by them. Increasing the Block sizes sounds like a good idea for the number of transactions flowing on the network, but in the near term it will drive a lot of the nodes out of the system because of CPU/bandwidth/disk IO hikes. Increasing the Block sizes will definitely increase infrastructure costs, driving more users towards centralized places that can afford to host API services for the Blockchain. However, given this crunch on the average joe Bitcoin nodes, this will lead to a more concentrated effort towards “pick what you need” style nodes (say, SPV). Again, in the near term, the number of “full nodes” on the network will dwindle, but as more companies come into the ecosystem, this number will inevitably rise. Bitcoin as a whole is headed towards a network where most nodes don’t actually host the entire Blockchain — increasing the block size will only accelerate this change. This will lead to more innovative solutions, and who knows, we might find a way for nodes to communicate cost-effectively rather than the current “gossip”-style protocol we use, where you inform all your peers when you hear about a new transaction. The community can very dynamic, and I think the longer term outlook for the network looks good regardless. Bitcoin is powered by nerds like you and I, and we tend to find solutions where others walk away. Nazir raises an interesting point in terms of a hypothetical time horizon for when a transition (between short term and long term) could take place. Changes to the distributed consensus software within Bitcoin raise really interesting questions about the evolution of cryptocurrencies and how truly decentralised they really are. With each change we’re actually seeing something interesting happen where the ongoing participants in the system all effectively agree to move to a new system: BTC becomes BTC’ becomes BTC”, etc. We might be calling BTC” Bitcoin but any legacy nodes running BTC’ or BTC also think they’re Bitcoin too. At some point in time something happens and the various systems start to disagree about what is or isn’t valid and those could be very subtle. Imagine for example that BTC” introduced a subtle change that inadvertently made some of Satoshi’s coins unspendable; nobody might ever know until someone with Satoshi’s keys tries to spend their Bitcoins. Arguably it might already have happened as the result of some random compiler bug (not a fault in the Bitcoin-core code, but a bug in the way that’s transformed into something that runs on the node CPUs). Clearly the Bitcoin-core developers try very hard to ensure that this sort of thing doesn’t happen by accident, but in order to sustain all participants holdings within the system they really do have to try to ensure that every node moves from BTC to BTC’ to BTC”, etc. In order to do this they essentially have to persuade everyone to migrate to each new version within some specific time window. Now let’s imagine for a moment that instead of miners all tending to mine through centralised infrastructure (mining pools), that we really did have true decentralisation and had hundreds of thousands, or millions, of nodes that all did their own transaction selection and mining. Perhaps they’re even embedded into things that their users didn’t even realise were contributing to mining. At this scale it would probably be almost impossible to get them all to move to adopt a planned fork. We would either see the protocol totally stagnate or else we would see potentially very significant forks occurring. In practice the system holds together in a cohesive way because, in the absence of a precise protocol spec, the core devs try to ensure that everyone uses the same consensus-critical software, runs it on the same sorts of hardware that all do things the same way and with some reasonably consistent set of capabilities. It’s seems a slight irony that one of the key factors in the successful maintaining and sustaining of the Bitcoin network is continual centralised actions, and that things aren’t actually massively decentralised. This last point is intriguing in that a lot of the software in this space is still relatively homogeneous and that if a network were to scale to become as distributed (or decentralized) as is hoped while simultaneously incorporating many nodes and clients, then it is likely that a diverse set (or lackthereof) of developer tools could prevent or perhaps even incentivize attacks (e.g., if every actor in the ecosystem uses the same client then that could create a vulnerability to the network). At the recent O’Reilly Media conference basically I pointed out that because this is an externality / tragedy-of-the-commons problem we may have to see Bitcoin fail due to a blocksize increase first before the community actually groks the issue. Personally I’m inclined to not oppose a blocksize increase on this grounds – Bitcoin failing cleanly is probably good for my interests. In terms of “getting people on board” – to a degree you inherently can’t do this, because a blocksize increase will inherently exclude people from the system. See for example the discussion between Greg Maxwell and Gavin Andresen several weeks ago on the #bitcoin-dev IRC channel. Levin’s point about network propagation is key: mining a larger block has a lower expected return because of the increased probability of losing out to a smaller block in an orphan race. Now all of what you argue is a totally sound economic conjecture based on the assumption of distributed mining economics. Miners include tx until the marginal cost of tx inclusion (opportunity cost of including a different tx when up against the block limit + block propagation effect) equals marginal revenue (the fee). However, for me the crucial economic force here is what happens to fees under concentrated mining. The logic changes from the marginal costs equals the marginal revenue logic in the above distributed case to a more strategic, oligopolistic pricing dynamic. What I mean is this. In the distributed case, whether or not a given miner includes a given tx has no material effect on the expected confirmation time for the tx sender. But in the concentrated mining scenario it does. If some pool is 35% of the network, the decision by that pool to not include the tx will materially increase the confirmation time of that transaction. So miners can extract more of the value that a tx senders place on fast confirmation times by setting their own minimum fee threshold, knowing that this threshold will over time effect the fees that tx senders include. What that optimal threshold is depends upon how much senders are willing to pay for faster tx confirmation times. Who knows what that is, but the implication is clear: under concentrated mining, fees levels will start to reflect more what tx senders are willing to pay rather than the cost to miners of including them. So when you cast the blocksize issue in this concentrated mining context, it’s really not clear what will happen. My bets are that fees will go up and we won’t have to worry about blocksizes because higher fees will act as a break on adoption. If block sizes are increased we will learn a lot about the dynamics of the community, the interplay between incentives such as fees and seigniorage have for on-boarding (and off-boarding) miners as well as how price sensitive users are in this space. In theory, fee rewards should incentivize miners to include as many transactions as possible. In reality though fee rewards are a tiny percentage of block rewards and the risk-rewards ratio simply doesn’t add up at the moment (risking a (almost) sure 25 BTC payoff to get a potential say 25.1 BTC). What are the rational incentives for miners to upgrade and actually fill 20mb blocks? At the moment there are none that I am aware of. If there are no incentives for miners then this is not going to happen. Period. There is no altruism when it comes mining and anyone who bets on it is in for a rude awakening. But this crosses over into the new field of cryptoeconomics which is a topic for another day. I would add that there is a downward pressure on block size for block makers. 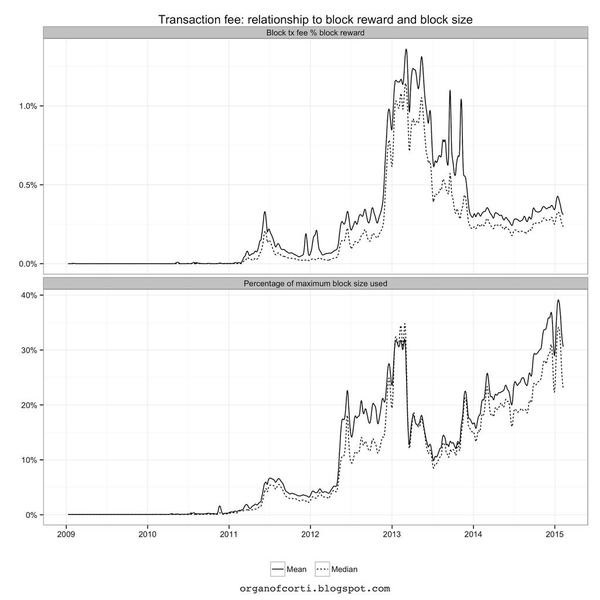 I’ve done some research with Nadi Sarrer that proves the larger the block, the longer propagation takes. Even if a pool uses the relay network, increased latency also increases the chance of a pool losing an orphan race. a) Pick a block size they think will make losing an orphan race less likely. With more data, this sort of process could be optimised to calculate the expected value of a block including the probability of losing orphan races. This would only lead to larger blocks when the value of the included txs outweighed the losses due to orphan races in the long term. Of course, if all block makers had the same sized blocks, this would not be an issue. But if a block maker can win an orphan race by the expedient of having a smaller block, then they will. Some open questions for the community: How will fewer network nodes affect orphan races? If the blocks are solved many seconds apart, I would think that fewer network nodes will mean fewer orphan races since the time for a block to propagate to most of the network will reduce significantly. However, if the blocks are solved at the same time, an orphan race might be more likely since the paths taken by the blocks propagating will have less affect on the overall propagation time. Which do you think is more likely? In summary: If block makers are rational actors and the risk of losing orphan races is a significant downward pressure on block size, I don’t think increasing the available block space will have a significant effect on actual block size. There’s a lot of room for improvement in the tx inclusion algorithms used by most pools, and if I was a block maker I would increase the fee density of blocks and include far fewer low-fee and fee-free txs. A few of the videos from the Cryptoeconomicon event are now online (repo). If you are interested, below are two of the panels I moderated on the first day.